This salad recipe is the ideal solution to a glorified version of a brown-paper-bag office lunch. Not only is it more "green" (or better for the environment), but it's also better for you. 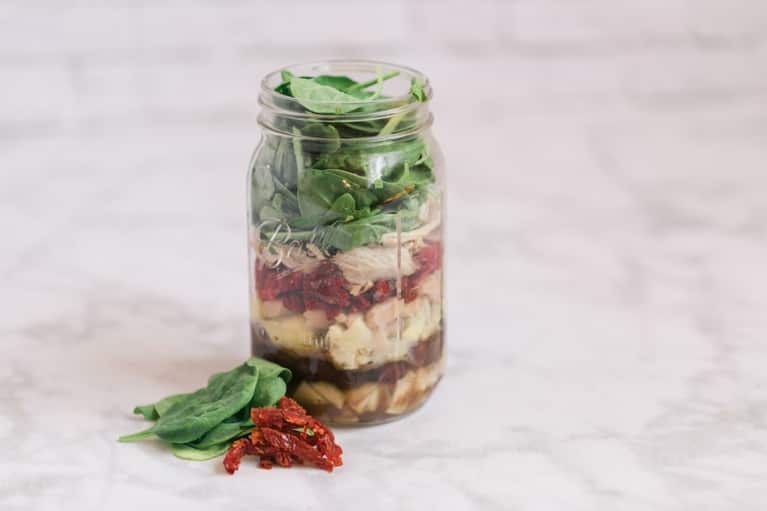 All the ingredients fit perfectly into a mason jar; it has an abundance of veggies, significant amounts of protein from the roasted chicken and the cannellini beans, and good-for-you fiber from the artichokes and sun-dried tomatoes. Make. Eat. Wash. Repeat. 1. Add vinegar, mustard, and extra-virgin olive oil to food processor and combine until emulsified. 2. Add sea salt and pepper to taste. 3. Serve with your favorite salad and enjoy! 1. Add 2 tablespoons Dijon balsamic vinaigrette to bottom of 1-quart Mason jar. 2. Add cucumbers, olives, and artichoke hearts on top of dressing. 3. Add the cannellini beans on top of the vegetables. 4. Add sun-dried tomatoes on top of the cannellini beans. 5. Top the sun-dried tomatoes with chicken. 6. Add spinach and basil on top of chicken. 8. Once ready to eat, shake jar, pour salad into a bowl, and enjoy!